Modelling and analysis of dynamical systems is a widespread practice as it is important for engineers to know how a given physical or engineering system will behave under specific circumstances. This text provides a comprehensive and systematic introduction to the methods and techniques used for translating physical problems into mathematical language, focusing on both linear and nonlinear systems. Highly practical in its approach, with solved examples, summaries, and sets of problems for each chapter, Dynamics for Engineers covers all aspects of the modelling and analysis of dynamical systems. Introduces the Newtonian, Lagrangian, Hamiltonian, and Bond Graph methodologies, and illustrates how these can be effectively used for obtaining differential equations for a wide variety of mechanical, electrical, and electromechanical systems. Develops a geometric understanding of the dynamics of physical systems by introducing the state space, and the character of the vector field around equilibrium points. Sets out features of the dynamics of nonlinear systems, such as like limit cycles, high-period orbits, and chaotic orbits. Establishes methodologies for formulating discrete-time models, and for developing dynamics in discrete state space. Senior undergraduate and graduate students in electrical, mechanical, civil, aeronautical and allied branches of engineering will find this book a valuable resource, as will lecturers in system modelling, analysis, control and design. This text will also be useful for students and engineers in the field of mechatronics. Soumitro Banerjee has been at the Indian Institute of Technology, in the Department of Electrical Engineering since 1985. He currently teaches courses on ‘Dynamics of Physical Systems’, ‘Signals and Networks’, ‘Energy Resources and Technology’, ‘Fractals, Chaos and Dynamical Systems’ and ‘Nonconventional Electrical Power Generation’. His research interests include bifurcation theory and chaos, and he has written and co-written over 43 papers on these subjects. I: OBTAINING DIFFERENTIAL EQUATIONS FOR PHYSICAL SYSTEMS. 1. Introduction to System Elements. 2. Obtaining Differential Equations for Mechanical Systems by the Newtonian Method. 2.3 Differential Equations from Newtons Laws. 2.4 Practical Difficulties with the Newtonian Formalism. 3. Differential Equations of Electrical Circuits from Kirchoff’s Laws. 3.1 Kirchoff’s Laws about Current and Voltage. 3.2 The Mesh Current and Node Voltage Methods. 3.3 Using Graph Theory to Obtain the Minimal Set of Equations. 4.1 Elements of the Lagrangian Approach. 4.2 Obtaining Dynamical Equations by Lagrangian Method. 4.3 The Principle of Least Action. 4.4 Lagrangian Method Applied to Electrical Circuits. 4.5 Systems with External Forces or Electromotive Forces. 4.6 Systems with Resistance or Friction. 4.7 Accounting for Current Sources. 4.9 A General Methodology for Electrical Networks. 5.1 First-Order Equations from the Lagrangian Method. 6. Unified Modelling of Systems Through the Language of Bond Graphs. 6.5 Junctions in Mechanical Systems. 6.9 The Concept of Causality. 6.11 Obtaining Differential Equations from Bond Graphs. 6.12 Alternative Methods of Creating System Bond Graphs. 6.16 Equations for Systems with Differential Causality. II: SOLVING DIFFERENTIAL EQUATIONS AND UNDERSTANDING DYNAMICS. 7. Numerical Solution of Differential Equations. 7.1 The Basic Method, and the Techniques of Approximation. 7.2 Methods to Balance Accuracy and Computation Time. 8. Dynamics in the State Space. 8.3 Local Linearization Around Equilibrium Points. 9. Solutions for a System of First-Order Linear Differential Equations. 9.1 Solution of a First-Order Linear Differential Equation. 9.2 Solution of a System of Two First-Order Linear Differential Equations. 9.5 Solution of a Single Second Order Differential Equation. 9.6 Systems with Higher Dimensions. 10. Linear Systems with External Input. 10.2 When the forcing function is a square wave. 10.4 Other forms of excitation function. 11. Dynamics of Nonlinear Systems. 11.1 All systems of practical interest are nonlinear. 11.2 Vector Fields for Nonlinear Systems. 11.3 Attractors in nonlinear systems. 11.4 Different types of periodic orbits in a nonlinear system. 11.7 Stability of limit cycles. 12.2 Obtaining a discrete-time model. 12.3 Dynamics of Discrete-Time Systems. 12.10 Bifurcations in 2-D discrete-time systems. 12.11 Global dynamics of discrete-time systems. 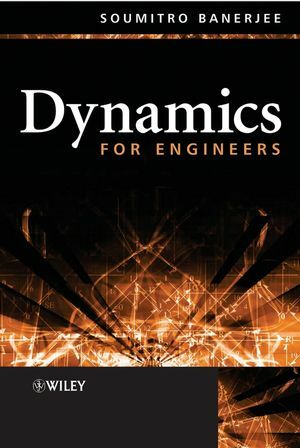 Dynamics for Engineers Visit author Soumitro Banerjee's website for a detailed discussion of the book and accompanying resource materials. Provides methodologies for modeling mechanical systems, electrical circuits, and electromechanical systems. Outlines the methods and techniques for translating a physical problem into mathematical language. Shows methods of analysing the dynamical behavior of systems through first order differential equations. Innovative in dealing with nonlinear systems at an early stage.